Sydney: The Wilderness Campaign is designed as a campaign introduction to an Aftermath! world. Although part of a campaign set in Sydney Australia, the information and ideas presented herein can easily be used in any campaign. Sydney: The Wilderness Campaign outlines the entire city and the suburbs surrounding it. Included are 25 complete communities with a discussion of their political organization, economics, attitudes, and even of their military capabilities. This package gives the entire area surrounding the University found in Operation Morpheus. 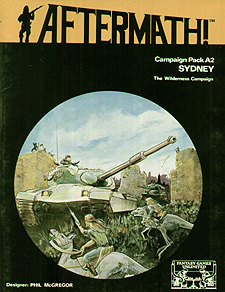 Sydney: The Wilderness Campaign is not a complete game but a background package for use with the Aftermath! game system. Aftermath! is required for play.